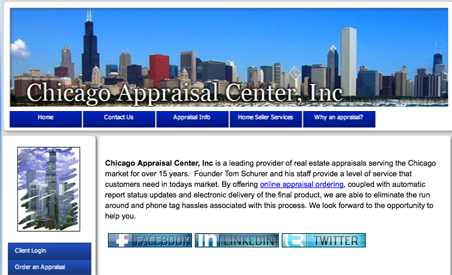 The Chicago Appraisal Center is the leading provider of real estate appraisals in the Chicago area. They offer online appraisals, automatic report status updates and electronic deliveries that eliminate the hassle associated with appraisals. The Chicago Appraisal Center offers a full range of real estate services, including tax assessments, estate planning, employee relocations and legal matters. They can also set a home’s sale price and remove private mortgage insurance. For most people, purchasing a home is the biggest investment they’ll ever make, and that’s why it’s important to use a trustworthy, experienced appraiser who will help you determine the accurate value of a property. With over 15 years experience, the Chicago Appraisal Center assists buyers in making informed decisions regarding their real estate transactions.